Most of us have heard of Music Choice — if you’re at a loss, we’re sure you’ve heard of the Music Choice App that offers 75 commercial-free music channels with a TV or internet subscription. As a nationwide company, working closely with famous musicians, televisions stars, and other celebrities, Music Choice is famous for programming audio music channels for digital cable subscribers, and much more. Being as they are, Music Choice came to Think Box Media for assistance with making their newly renovated office truly one-of-a-kind. With wall murals and dimensional lettering becoming popular in offices globally, Music Choice had a unique and invigorating vision in mind. Who better to help them make it a reality than us at Think Box Media? As a one-stop-shop for all high-quality visual printing, we were more than capable to not just tackle the project head-on, but to also bring our own ideas to the table. We worked closely with Music Choice’s designers to come up with a stable plan for the graphics in order to fulfill the overall aesthetic that needed to be achieved. In order to make this happen, we set to work on a number of different things to ensure the final result was absolutely stunning. In order to measure the space for an accurate depiction, we conducted site surveys prior to installation. Working together with Music Choice, we handled this project all the way from initial concept all the way to production and installation. While the images are large format adhesive, the quote lettering was created using dimensional laser cut acrylic. 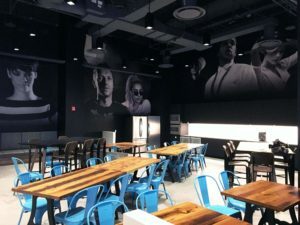 With quotes and imagery decorating Music Choice’s new office, those who walk the halls or ascend the stairs will be escorted by visual and poetic cohesion anywhere they go. We are proud to be able to produce the caliber of work we deliver here at Think Box Media. If your business is looking for the same treatment, do not hesitate to contact us today. No project is too large scale, small, or out-of-the-box for us to handle. Please take a look at a time lapse of our work on Music Choice’s office. Here, you can see what goes into the installation of our projects.